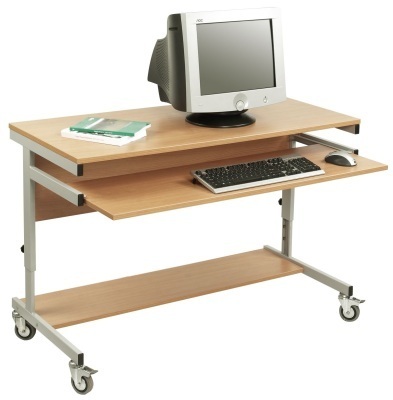 Mobile workstations with adjustable height features, making it ideal for use in public buildings, schools and offices. Features of this product include a pull out keyboard shelf, a fixed bottom shelf for extra storage and a four-way power module attached to the side of the work station. This product helps to ensure a tidy workspace with lots of space for books and other items. These mobile workstations are height adjustable and are delivered flat packed for easy self-assembly. Available with a Beech or Grey MFC and available in a choice of 3 frame colours including Blue, Red or Grey. Available for a free UK mainland delivery within 2 weeks from the date of order. There is a 4-way power supply and a lower shelf included and this unit has the ability to fit 2 computers side by side.